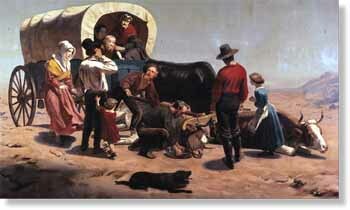 Many of the immigrants who rushed to California from the eastern United States, Canada or Mexico chose to come by land. The journey was long, hard and dangerous--a six to nine month trek--and it meant parting from family and friends. Immigrants crossed the continent in great numbers--at least 32,000 walked overland in 1849, and another 44,000 came in 1850. The "forty-niners" recorded the challenges, hardships, struggles, and dangers they encountered. Gold fever was quickly diminished by the harsh realities of the trip. Equipment and cherished personal objects were cast aside in a desperate struggle to survive. If cholera, exhaustion, starvation, or the on-set of winter in the Sierra didn't claim them, the argonauts arrived in the foothills of California only to discover that most of the easy placer gold had already been picked up. But they had survived, and new opportunities awaited them.